Happy New Year everyone! 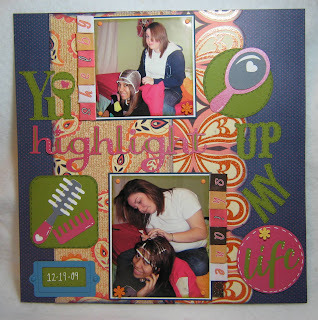 Since my last layout of the year was about hair I thought it appropriate to start out 2011 with a layout about hair! This is one of the 3 layouts I did a few weeks ago. My daughter's friend Shelby came over to frost Shiane's hair and me being a shutterbug thought I needed to snap a few pictures. Luckily my daughter is use me taking pictures of her and did smile for the pictures instead of frown about me taking pictures of her in the cap. The patterned paper is from a $5 pack that I picked up at Big Lots on one of Linda, aka LGuild, and I's excellent adventures and I thought the colors went well with the colors in the pictures. I used several cartridges for this layout. The title words were done with Graphically Speaking, Lovely Florals, Once Upon a Princess and something else that I can't remember. The mirror and come and brush cuts were done with Slumber Party. I wish I had cut the "highlight" with a different color because it kinda blends in too well with the patterned paper. But what's done is done! It is easier to see in person than in the photo. I cut the highlight in green also, using the hide contour feature for the open spaces in the lettering *okie is so all about layering*. I added white dots with a white gel pen. For the other letters I just did some faux stitching. You can see the cuts from slumber party a little better in this picture. 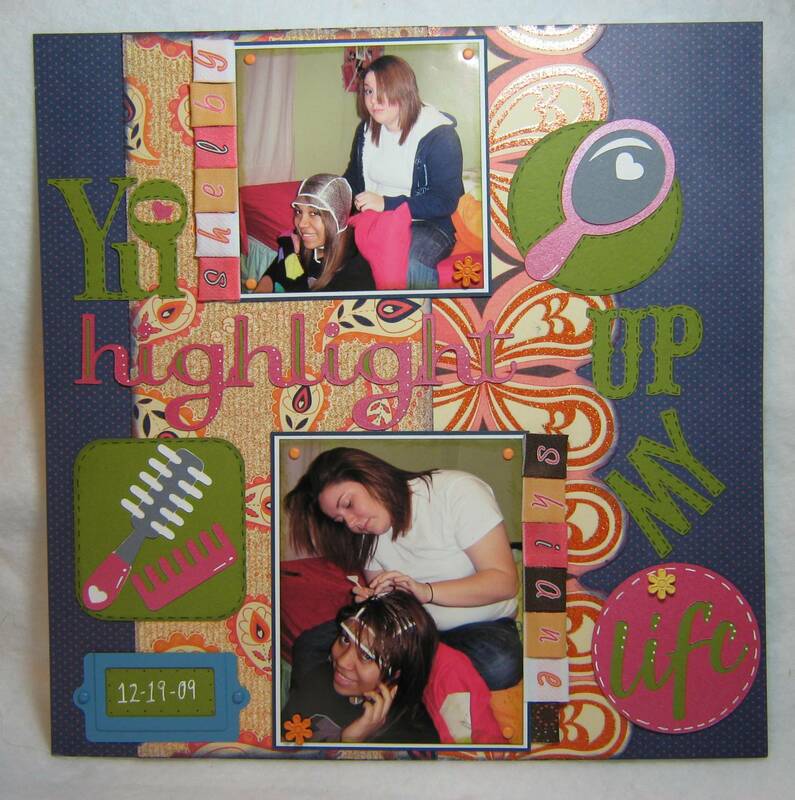 I think if you have girls to scrapbook about you really need this cartridge! There are so many neat things on that cartridge. I actually have another layout in Design Studio ready to cut using Slumber Party. 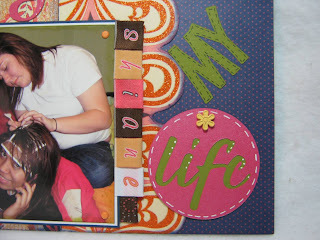 I didn't think the layout needed journaling because the pictures and title pretty much tell the story. I did want to put their names since my friend Linda, aka LGuild, tells me all the time that I need to include names for people looking at my layouts and not knowing who the people are *okie will always believe Linda, aka LGuild, is just too dang bossy*. Oh but back to the names. 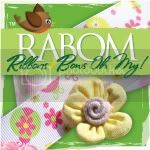 I was trying to think about how to do them and I looked up on my handy dandy pegboard and saw these ribbon letters that my friend Softbrn sent me a long time ago. I was so excited about how well they matched the layout! They had a little piece of adhesive on them so all I had to do was apply to the pictures. The little flower brad is a Stampin Up brad. Overall I like the layout and the colors. I just don't like the one issue about the "highlight" word. Now, inquiring minds want to know if you were sitting on the floor in Big Lots. LOL! what a great thing to remember! graet job! Another Great Layout Okie! Great news about the car for your daughter and the fridge! I guess the New Year is starting out great for you! I Hope it continues! I also LOVe that paper you chose for the layout... Thanks for Sharing it! :o) Ohhh... HAPPY NEW YEAR!!! Hope Shiane's hair turned out as good as your page did. Maybe slip a small rectangle of dark blue behind the h and t? 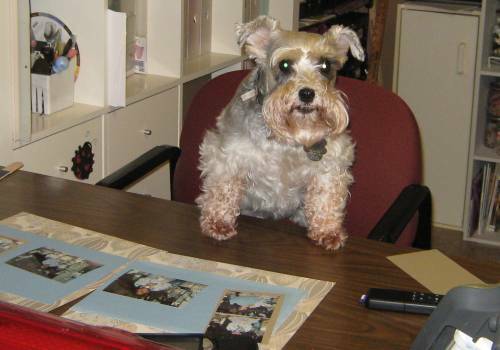 Great layout, Shirley ... but I love, love, love your new 'look"! 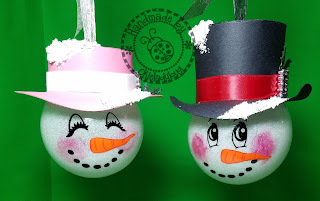 Those glossy little ladybugs are just too cute! Okie, Love the new look on the blog:) As always your LO is wonderful thanks for sharing all of your talent. A new year and and a new Okie? Love your new look girlfriend. CUTE! How I LOVE Hair Styling Pages! 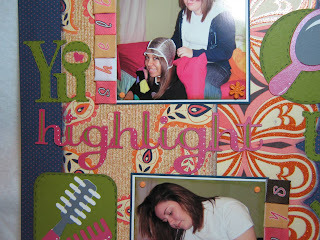 :) I was a hair stylist in my former life ;) .... well before the blogging days of crafting anyway! ;) LOVE IT Okie! Now I need slumber party, love your new blog background too. Like your look of the blog, and I love the layout! I love the blog makeover it is so cute and colorful! BTW cute layout. Love the new look of the blog. So bright and fun. 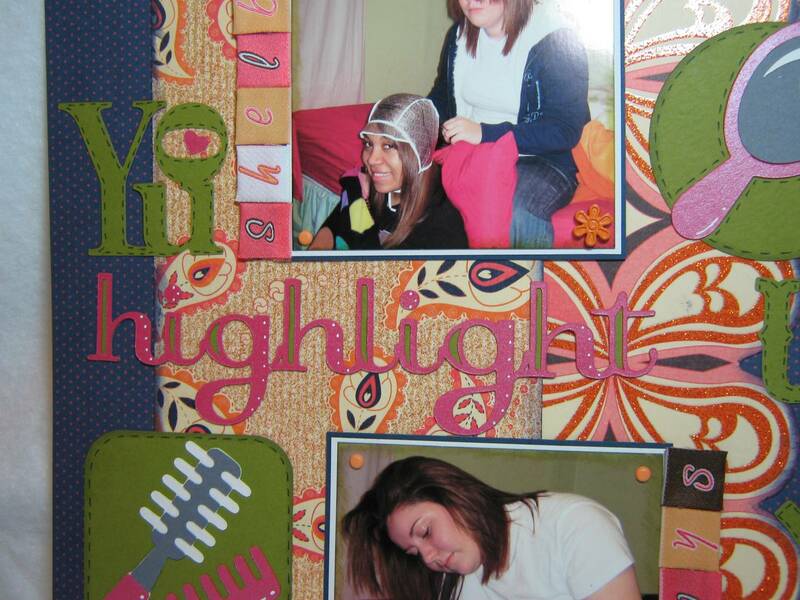 And I think it's great that you scrapbook the things we all do on a "regular" day. Can't wait to see the cute scrapbook page you come up with for the next "maintenance" day. Hi Okie - love your layout!!! Here is looking toward a new year with less stressors in your life. You are such an inspiration to all!! Take care!! Bossy, but right. In a few years you and Shiane may not remember her friend's name. And, as you get older, you might not even remember your own! LOL! Great layouts love the directions, thanks I just became a follower. Keep the ideas comming. What an absolutely cute LO!